Object History: This charge plate belonged to local artist Claude Howell (1915-1997). Howell donated a large collection of materials to the Cape Fear Museum in his will. Howell lived and worked in Wilmington for most of his life. 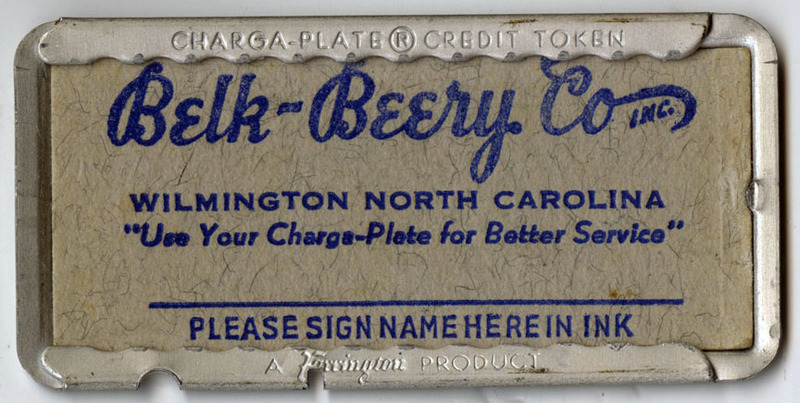 By the 1950s, when he used this charge plate, he was a well-known artist, and he taught at Wilmington College, the predecessor to UNC Wilmington. General History: Wilmington’s first department store opened in 1903 and, since that time, the Port City has had as many as 20 stores. Throughout most of the 1900s, Wilmington’s department stores were located downtown. Shopping began to move to the suburbs in the 1960s. The last significant department store left in downtown Wilmington was Friendly Department Store. When it went out of business in 1995 ended more than 90 years of department stores having a continuous presence downtown. Belk department store was founded in 1885 in Monroe, North Carolina by William Henry Belk. Belk formed partnerships with merchandisers in various markets which resulted in hyphenated names. Belk opened its first store in Wilmington, Belk-Williams Co., on the on the 200 block of N. Front Street in 1917. In 1952, the store became Belk-Beery. This name change coincided with a move to 201 Chestnut St. In 1979, Belk-Beery moved their operations from Chestnut St. to Independence Mall. In 2000, Belk opened a second Wilmington location on Military Cutoff Road and, in 2007, a third store opened in Mayfaire Towne Center.